When it comes to probiotics, skin health is probably not the first thing that comes to mind. Probiotics have been all the rage for gut health, but did you know there are probiotics for skin care? 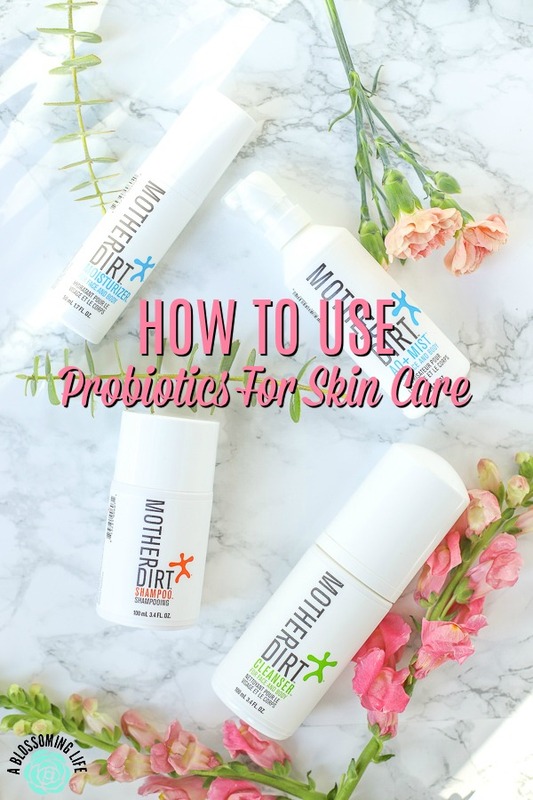 Today, we are going to look at how to use probiotics for skin care, and why you’ll definitely want to incorporate them into your routine. Follow my tips below for using probiotics for skin care. This post is sponsored by Mother Dirt. All opinions are my own. We live in a very clean world, but is that always a good thing? As it turns out, not really. Don’t get me wrong: it’s great we live a clean world, but we are losing out on a lot of the benefits of healthy bacteria. We shouldn’t be afraid of ALL germs. I have to admit firsthand that I’m a bit of a germaphobe. My hands are basically always dried and cracked from washing them constantly. But in my defense, dealing with boogers, dirty diapers, and kids in general, in all their sticky-handed glory, will make anyone a bit of a clean freak. However, all the constant cleaning and hand washing can throw off the good bacteria on our skin. This is not a good thing – we need good bacteria for our guts and on our skin! I for one, know that I need more good bacteria on my skin, and this is where you can use probiotics to help you out. Probiotics are live beneficial bacteria. Usually, you hear about probiotics when we talk about gut health, but probiotics can also be beneficial in skin care. Probiotics can be found in dirt, fermented foods, and in pills, but now they can also be used in skincare. Yes! Mother Dirt live probiotics, like in the AO+ Mist, have been clinically proven to restore balance and clarity to the skin in 4 weeks. I could notice a difference in my skin within just a week or two. Probiotics can help restore the bacteria in your skin, bring balance to your skin microbiome, and can have great benefits to your skin’s tone and texture. How Do You Use Probiotics For Your Skin? Using probiotics for your skin is pretty darn easy, as long as you have the right products. 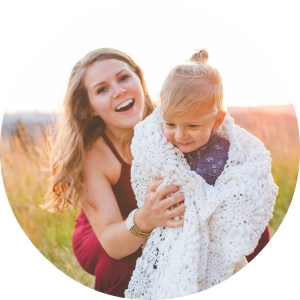 Spray live probiotics, like Mother Dirt’s AO+ spray twice a day, on face and body, specifically concentrating on problem areas (i.e. underarms, face, etc.). Make sure to use biome-friendly products. When you wash your face or shower, make sure you use biome-friendly products. Most soaps and products strip the good bacteria from your skin. Mother Dirt products are biome-friendly. I’ve been using Mother Dirt products for about two weeks so far and I see improvement in my skin clarity and overall balance. My skin is feeling more hydrated, smoother, and has helped improve the appearance of some of my problem skin areas. Also, we will talk a little more about this below, but my underarm odor has decreased immensely! That is a serious win. When it comes to skincare, I have super high standards and make sure everything is safe. That’s why I love Mother Dirt products: they’re just simple ingredients that work. They contain no artificial preservatives or fragrances. Their products are good for all skin types, and can help restore balance to your skin. And the best part of all is that Mother Dirt products are biome-friendly and don’t disrupt the good bacteria on your skin. I ran the ingredients through EWG, and all of them came out with great ratings. Shampoo is one of the hardest natural products, in my opinion. I’ve used a variety and have a difficult time finding one that actually works, and doesn’t leave my hair greasy. I was nervous to try Mother Dirt shampoo, but honestly, I’m in love. My hair feels super clean, shiny, and healthy. I can also go multiple days between shampooing which is great. Another favorite is their moisturizer. It goes on like silk and absorbs quickly without a greasy feeling, and it goes so well with the cleanser, which can be used for the face and body. It’s great that you can use their products both for your face and body: it’s perfect for a minimalist. I tend to keep my skin care routine as simple as possible, and I love that only a few products can be used effectively for your whole body. Can probiotics help with body odor? 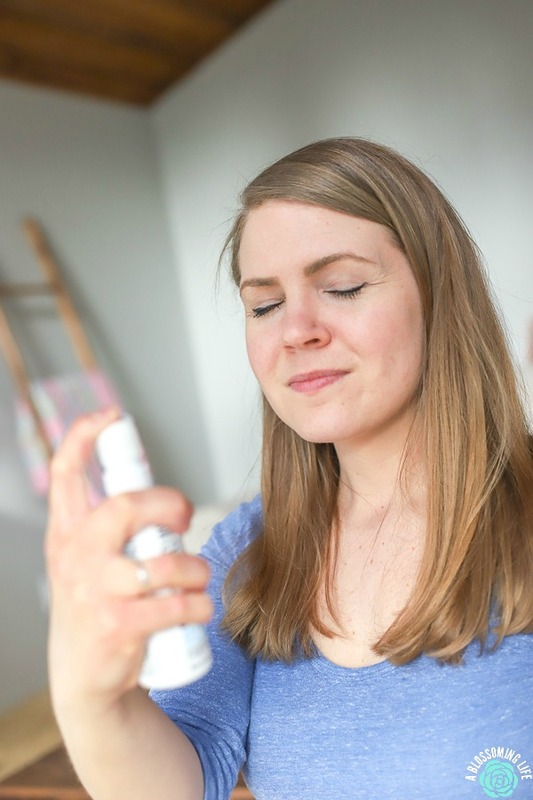 We’ve talked about this in the past, but for the longest time, I’ve dealt with underarm odor. I’ve come up with a few natural deodorants that work great, but every night I take a shower, and every morning when I wake up, I already stink. It’s crazy. It was super intriguing to read that probiotics can help with body odor; could they really help a stinky soul like myself? Turns out: yes! After just a few days of using Mother Dirt products and the Live AO+ spray, I noticed I was waking up without my underarm stinking. This is huge. 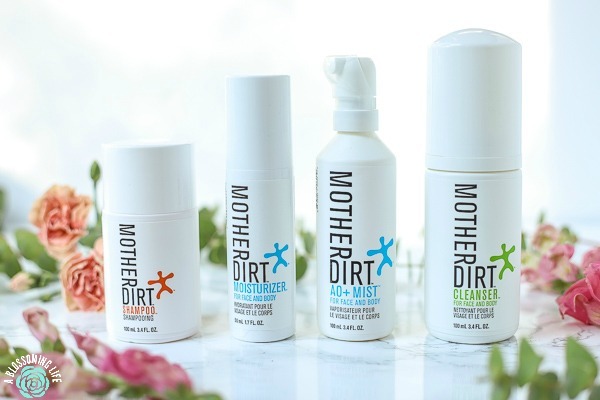 If you want to find out more about Mother Dirt and their biome-friendly products, check them out here. Want more healthy skin posts? Check these out! Homemade Makeup Remover – is my go to simple recipe. Only 1-2 ingredients. I hope you learned something new today about probiotics for skin care, and that this year you focus on healthier skin with good bacteria. Let me know in the comments below; have you have used probiotics on your skin before? Thank you so much for Mother Dirt for sponsoring this post. I’ve been looking for new skin care products that have probiotics in them. These sound perfect. Checking them out now. Thanks. Yay! These products are awesome Susan.